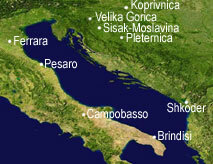 The WaterCycle Project focuses on the exchange of experiences, good practices and pilot actions in the field of planning and managing water resources in catching basins, coastal areas and lagoons on the shores of the Adriatic Sea, with a view to developing new synergies and technical-scientific cross-border partnerships. The actions foreseen, different in the different areas, are the following: drawing up a mathematical model to describe the water regimen; studies and projects to ensure the safety of rivers and the environmental sustainability of the water cycle; innovative solutions for purification of water and tests on the re-use of waste waters and slush; innovative solutions following urban purification; experimental use of waste water and slush; systemic actions to test the method of “continuous dialogue” between Institutions and Bodies responsible for managing and monitoring water resources; pollution monitoring and awareness-building campaigns for the pre-emption of pollution; recovering the environmental balance of water supply systems and waste water treatment; renewing existing plants. The project is targeted at public administrations; executive managers and technical experts of public territorial institutions; executives and staff members of water cleansing plants; executives and staff members of land reclamation consortia and basin management boards; research and service centres; citizens and representatives of environmental and SMEs associations.